On this page I present a solution to these problems that ensures resilience of connection to Plantronics COM API covering the scenarios mentioned above. Move all the code that connects / interacts with Plantronics COM API into a seperate class with its own thread. Now Plantronics COM API interaction is done on its own thread it will not impact your application's performance even if a COM timeout / exception occurs. This class is called HubSDKConnector. Code for this sample: click here>> (note: you must be registered and signed in to access this). The code is functionally the same is as the basic C# sample (in Get Started, C# Tab), with the integration code moved into HubSDKConnector.cs. 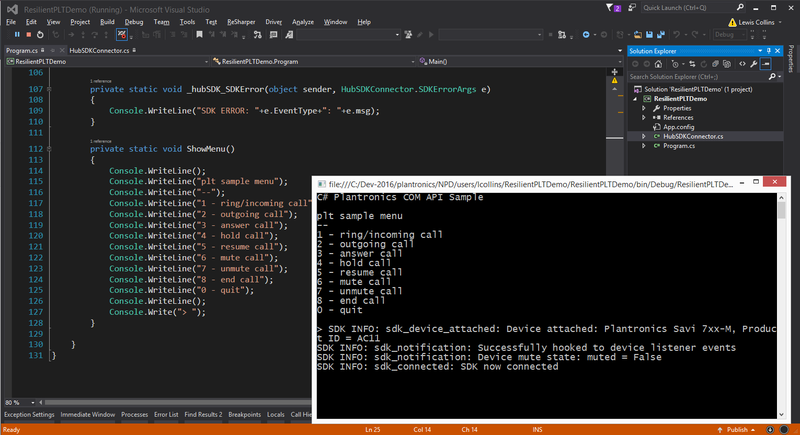 The code is in C#, but the same concept could be implemented in C++ with the Plantronics COM API. Here is a screenshot of it running. Great post!! Nice and effective blog post. The content is too short but effective. I love the information you share here. It’s a well written blog post by you. This is awesome blog post.Basically I'm a writer I would like to share my website here best essay writing service and sometimes I wait for your post to get more this type of blogs. A good blog always comes-up with new and exciting information and while reading I have feel that this blog is really have all those quality that qualify a blog to be a good one. What a great post, love this post! Great blog you have Thanks for sharing.